Oliver! was the first musical adaptation of a famous Charles Dickens work to become a stage hit. (Besides the fame of Oliver Twist, another reason for the success of the musical was the revolving stage set, designed by Sean Kenny.) There had been two previous Dickens musicals in the 1950s, both of them television adaptations of A Christmas Carol. The show launched the careers of several child actors, including Davy Jones, later of The Monkees; Phil Collins, later of Genesis; Alan Paul, later of The Manhattan Transfer; and Tony Robinson, who later played the role of Baldrick in the television series Blackadder. The singer Steve Marriott (Small Faces, Humble Pie) also featured in early line-ups, eventually graduating to the role of Artful Dodger in the West End production. The plot of Dickens' original novel is considerably simplified for the purposes of the musical, with Fagin being represented more as a comic character than as a villain, and large portions of the latter part of the story being completely left out. (It may well be that Bart based his musical on David Lean's film, rather than Dickens' book). Although Dickens' novel has been called antisemitic in its portrayal of the Jew Fagin as evil, the production by Bart (himself a Jew) was more sympathetic and featured many Jewish actors in leading roles: Ron Moody (Ronald Moodnik), Georgia Brown (Lilian Klot), and Martin Horsey. Oliver! premiered in the West End at the New Theatre (now the Noel Coward Theatre) on June 30, 1960 and ran for 2,618 performances.Directed by Peter Coe, the choregrapher was Malcolm Clare and costumes and scenery were by Sean Kenny. The original cast featured Ron Moody as Fagin, Georgia Brown as Nancy, and Barry Humphries in a small comic role as Mr. Sowerberry, an undertaker. Keith Hamshere (the original Oliver) is now a Hollywood still photographer (Star Wars etc. ); Martin Horsey (the original Dodger) works as an actor/director and is the author of the play L'Chaim. The cast also included Tony Robinson as one of the Workhouse boys/Fagin's Gang, and John Bluthal (now best known as The Vicar of Dibley's Frank Pickle) as Fagin. Former professional boxer Danny Sewell ( brother of television actor George Sewell ) was the original Bill Sikes, and remained in the role ( including the original Broadway & US touring productions ) for the best part of six years. Danny Sewell's main competitor at audition for the role of Sikes was Michael Caine, who later stated he "cried for a week" after failing to secure the part. The musical previewed in the U.S. with a 1962 national tour (whose cast was preserved on recording). The musical premiered on Broadway at the Imperial Theatre on January 6, 1963 and closed on November 14, 1964 after 774 performances. The cast featured child actor Bruce Prochnik in the title role alongside Georgia Brown, reprising her West End role as Nancy, and Clive Revill, replacing Ron Moody, as Fagin. While the national tour had young actor Michael Goodman as The Artful Dodger, in the Broadway transfer he was replaced by a young Davy Jones (who would appear in the role on The Ed Sullivan Show the night of The Beatles first appearance). The Broadway production was a critical success and received ten Tony Award nominations, including Best Musical, Best Actor in a Musical, Best Actress in a Musical and Best Featured Actor in a Musical. It won the awards for Best Scenic Design, Best Original Score and Best Music Direction. The Broadway production was revived shortly after the original production closed. The revival opened in 1965 and was directed by Peter Coe. It ran at the Martin Beck Theatre for 64 performances. 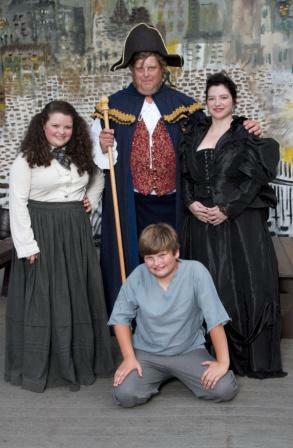 It featured Victor Stiles as Oliver, Robin Ramsay as Fagin, Maura K. Wedge as Nancy, Joey Baio as The Artful Dodger, Alan Crofoot as Mr. Bumble, Danny Sewell as Bill Sikes, Bram Nossen as Mr. Brownlow, and Dodi Protero as Mrs. Bedwin. In 1968, the show was adapted for film, with a screenplay by Vernon Harris and direction by Carol Reed. It starred original Fagin Ron Moody with Jack Wild, Shani Wallis, Oliver Reed, Mark Lester and Harry Secombe. The 1968 motion picture won six Academy Awards including Best Picture, and received nominations for both Moody and Wild. It was first telecast by ABC-TV in 1975. The musical opens in the workhouse, as the half-starved orphan boys are entering the enormous lunchroom for dinner ("Food Glorious Food"). They are fed only gruel. 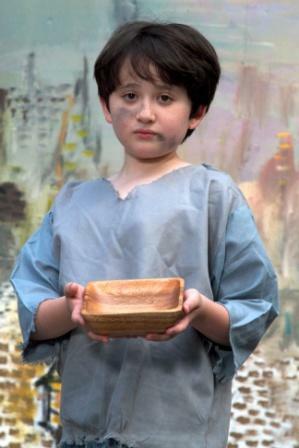 Nine-year-old Oliver (actually identified as thirteen in the libretto but generally played as much younger) gathers up the courage to ask for more. He is immediately apprehended and is told to gather his belongings by Mr Bumble and the Widow Corney, the heartless and greedy caretakers of the workhouse ("Oliver!"). Mr.Bumble and Widow Corney are left alone, and Mr. Bumble begins to make amorous advances. Mrs. Corney pretends to resent his attentions in "I Shall Scream! ", ends up on Mr Bumble's lap, kissing him. Oliver comes back and is promptly sold ("Boy for Sale") and apprenticed to an undertaker, Mr. Sowerberry. He and his wife taunt Oliver and Mr. Bumble with the song "That's Your Funeral". He is sent to sleep in the basement with the coffins, something which makes him visibly uncomfortable. ("Where is Love?"). The next morning bully Noah Claypole, who oversees Oliver's work, badmouths Oliver's dead mother, whereupon Oliver begins pummeling him. Mrs Sowerberry and her daughter, Charlotte run in, and become hysterical. Mr. Bumble is sent for, and he and the Sowerberrys lock Oliver in a coffin, but during all the commotion Oliver escapes. After a week on the run, he meets the Artful Dodger, a boy wearing an oversize coat and a top hat. He beckons Oliver to join him with "Consider Yourself". Dodger is, unknown to Oliver, a boy pickpocket, and he invites Oliver to come and live in Fagin's lair. Fagin is a criminal, and he is in the business of teaching young boys to pick pockets. Oliver, however, is completely unaware of any criminality, and believes that the boys make handkerchiefs rather than steal them. Oliver is introduced to Fagin and all the other boy pickpockets, and is taught their ways in "You've got to Pick a Pocket or Two". The next day, Oliver meets Nancy, the live-in girlfriend of the evil, terrifying Bill Sikes, a burglar whose abuse she endures because she loves him. Nancy and Oliver take an instant liking to each other, and Nancy shows motherly affection toward him. Bet, Nancy's younger sister (merely her best friend in the 1968 film and in Dickens' novel), is also with her. Nancy, along with Bet and the boys, sing about how they don't mind a bit of danger in "It's a Fine Life". Dodger humorously starts pretending to be an upper-class citizen, ("I'd Do Anything"), along with Fagin, Oliver, Nancy, Bet, and the boys mocking high society. Nancy and Bet leave and Oliver is sent out with the other boys on his first pickpocketing job ("Be Back Soon"), though he still believes that they are going to teach him how to make handkerchiefs. The Dodger, another boy pickpocket named Charley Bates, and Oliver decide to stick together, and when Dodger and Charley rob Mr. Brownlow, a wealthy old man, they run off, leaving Oliver to be arrested for the crime. In the Three Cripples pub, Nancy is called upon to sing an old tavern song ("Oom Pah Pah"). Brutal housebreaker Bill Sikes makes his first appearance, and disperses the crowd, ("My Name"). It emerges that Nancy is in love with him. Dodger runs in and tells Fagin about Oliver being captured before being subsequently cleared of the crime and taken in by Mr. Brownlow. Fagin and Bill decide to kidnap Oliver to protect the whereabouts of their den. Nancy, who pities Oliver, refuses to help, but Bill physically abuses her and forces her into obedience. In spite of this, Nancy still loves Bill, and believes he loves her too ("As Long As He Needs Me"). The next morning, at Mr. Brownlow's house in Bloomsbury, Ms. Bedwin, the housekeeper (who sings in the stage version, but not in the film), sings to Oliver, ("Where Is Love? (Reprise)", and Oliver wakes up. Mr. Brownlow and Dr. Grimwig discuss Oliver's condition. They come to the conclusion that he is well enough to go outside, and Mr. Brownlow sends Oliver on an errand- he asks him to return some books to the library. From his window, Oliver sees a group of street vendors and joins them in song once he steps outside ("Who Will Buy?"). As the vendors leave, Nancy and Bill show up and grab Oliver. They bring him back to Fagin's den, where Nancy saves Oliver from a beating from Sikes after the boy tries to flee but is stopped. Nancy angrily and remorsefully reviews their dreadful life, but Bill maintains that any living is better than none. Fagin tries to act as an intermediary ("It's A Fine Life (reprise)"). When Sikes and Nancy leave, Fagin, who also wants out, ponders his future in the humorous song "Reviewing the Situation". But, every time he thinks of a good reason for going straight, he reconsiders and decides to remain a criminal. Back at the workhouse, Mr. Bumble and the Widow Corney, now unhappily married, meet up with the dying pauper Old Sally and another old lady, who tell them that Oliver's mother, Agnes, left a gold locket (indicating that he comes from a rich family) when she died in childbirth. Old Sally stole the locket and now gives it to the Widow Corney. Mr Bumble and Widow Corney, realizing that Oliver may have wealthy relatives, visit Mr. Brownlow in order to profit from any reward given out for information of him ("Oliver! (reprise)"). He throws them out, knowing that they have suppressed evidence until they could get a reward for it. Brownlow looks at the picture inside the locket, a picture of his daughter, and realizes that Oliver, who knows nothing of his family history, is actually his grandson (Oliver's mother had disappeared after having been left pregnant by her lover, who jilted her). Nancy, terrified for Oliver and feeling guilty, visits Brownlow and promises to deliver Oliver to him safely that night at midnight on London Bridge - if Brownlow does not bring the police or ask any questions. She then ponders again about Bill in "As Long As He Needs Me (reprise)". Bill suspects that Nancy is up to something. That night, he follows her as she sneaks Oliver out, although in the stage version it is never made clear how he knew exactly when to do this. At London Bridge, he confronts them, knocks Oliver temporarily unconscious, and brutally clubs Nancy to death (in alternative stagings of the show, he either strangles her, stabs her, or slits her throat, but the musical's original libretto follows the Dickens novel in having her beaten to death). He then grabs Oliver, who has since revived, and runs offstage with him, presumably back to the hideout to ask Fagin for getaway money. Mr. Brownlow, who had been late keeping the appointment, arrives and discovers Nancy's body. A large crowd soon forms, among them the distraught Bet. Bullseye, Bill's fierce terrier, returns to the scene of the crime and the crowd prepares to follow him to the hideout. After they exit Fagin and his boys, terrified at the idea of being apprehended, leave their hideout in panic. Not finding Bill at the hideout, the anxious crowd, now whipped up into a thirst for justice, returns to the Thames Embankment, when suddenly Bill appears at the top of the bridge, holding Oliver as hostage and threatening to kill him if the crowd tries to take him. Unseen by Bill, two policemen sneak up on him. One of them fatally shoots Bill and the other grabs Oliver as Bill releases him. Oliver is then reunited with Mr. Brownlow. 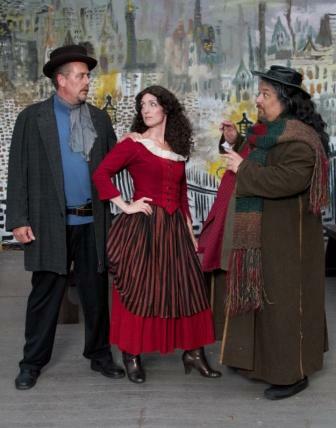 The mob, still eager for vengeance against this underground criminal network, begins a mad search for Fagin. When one of the members of the crowd suggest that he may be at the Three Cripples pub, they disperse offstage in order to track him down. As the crowd exits, Fagin sneaks on and sings a reprisal of "Reviewing the Situation," wherein he decides that, after years of pickpocketing and training junior pickpocketers, the time has never looked better for him to straighten out his life. The Robbery - Oliver, Dodger, Mr Brownlow and Ensemble.